As Charlie always states pandas here at Charlie Bears dont always have to be just black and white and Olien here as you can see is far from being traditional in colour. Olien has been created using soft muted antique colours of creams and blue and powder blue embroidery thread has been used to create her hand stitched nose. She has fully sculptured paw pads with additional toe stitching and has been softly filled to give her a perfect weight. Charlie Bears have introduced blue teardrop markings to enhance her glossy eyes and added a tonal sheer ribbon to nish her look. As Charlie always states panda���s here at Charlie Bears don���t always have to be just black and white and Olien here as you can see is far from being traditional in colour. Olien has been created using soft muted antique colours of creams and blue and powder blue embroidery thread has been used to create her hand stitched nose. She has fully sculptured paw pads with additional toe stitching and has been softly filled to give her a perfect weight. 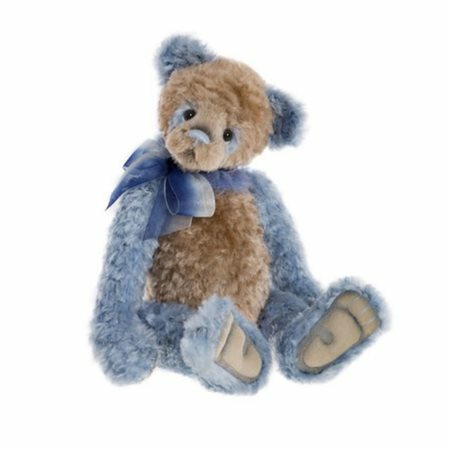 Charlie Bears have introduced blue teardrop markings to enhance her glossy eyes and added a tonal sheer ribbon to nish her look. Part of the 2017 Collection "IN A LAND FAR, FAR AWAY"